Woohooo! It’s Greeley Grindhouse time at Greeley Avenue Bar and Grill this Thursday, July 24th, at 7:20 p.m. Join us for “Planet of Dinosaurs” made in 1977. After mechanical issues on the spaceship Odyssey, Captain Lee Norsythe (Louie Lawless) is forced to crash land on a planet with atmosphere and conditions very similar to Earth. As the ship sinks into the lake, communications officer Cindy (Mary Appleseth) realizes that she forgot the radio in the ship and attempts to retrieve it, with the assistance of fellow crew-member Chuck (Chuck Pennington). During the search, Cindy is attacked and killed by an unidentified creature. Chuck decides continuing the search for the radio isn’t the best idea and leaves it behind. Realizing that they are stranded, the remaining eight people decide to explore the planet. After exploring for a while they run into a Brontosaurus, and it dawns on them that the planet is following a similar evolutionary track as Earth, but is millions of years behind. 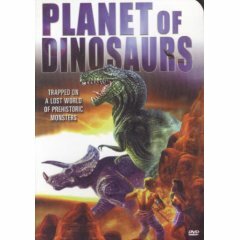 Their luck doesn’t improve as Charlotte (Charlotte Speer) realizes that the plant life, especially the berries, are poisonous, and Lee witnesses a fight between a Stegosaurus and a large Tyrannosaurus. Lee decides that the best option is to climb the mountains and reach higher ground where he thinks the creatures will be unable to reach them. During the climb, Nyla (Pamela Bottaro) slips and loses the entire supply of food rations. In a cave higher up the mountain, Vice-President of Spaceways Incorporated Harvey Baylor (Harvey Shain) discovers a nest full of eggs. After stealing an egg, Harvey is attacked and killed by a Centrosaurus. Soon after, much to ship engineer Jim’s (James Whitworth) dismay, Lee decides to halt the expedition and settle at what he considers an area where they can defend themselves and the idea of never being rescued is now beginning to settle in. After several more encounters, including a giant spider, Struthiomimus and an Allosaurus, the large Tyrannosaurus arrives and kills Derna, demolishing the stockade in the process. So what happens next with this crew who is dwindling away? Will they be rescued or are they forever left to fend themselves against dangerous dinosaurs? Will they stick together as a team or turn on each other as well? Find out this Thursday night, July 24th, at 7:20 p.m.
Have a great week and we’ll see ya there! This entry was posted in Entertainment and tagged & grill, 1977, dinosaurs, free movie, free movie night, Greeley Avenue Bar and Grill, Greeley Grindhouse, Mac Bell, Planet of Dinosaurs, sports bar, sports bar and grill, things to do in Porltand by greeleyave. Bookmark the permalink.